Rifton small mobile stander provides new independence and standing mobility for wheelchair- bound clients. Rifton mobile stander a mobile prone stander makes it easy - even for those with no weight-bearing ability. More importantly, this mobile stander helps strengthen critical motor skills so a user can progress toward independent standing. Skill building in action - With regular use, the Mobile Stander provides a way for clients to strengthen motor skills and work toward independent standing. Freedom to participate - Remove its large wheels, and the Rifton mobile prone stander easily rolls right up to a table or a counter enabling participation in crafts and other stationary activities. Freedom to explore - With the Rifton mobile stander’s removable large wheels in place, clients can self-propel in a standing position – free to explore their surroundings alongside (and often ahead of!) their playmates. Knee straps - Knee straps provide abduction when desired. Fleecy strap - A soft fleecy strap provides the client with back or neck support while standing. Casters - Large casters allow the mobile stander to move easily during activities, yet lock securely during transfer. Arm prompts - Optional arm prompts help clients develop greater head and shoulder control. They can be removed as control improves. Communication tray - The optional and fully adjustable communication tray holds small objects or activities for easy access while standing. Accessible deck - Mobile stander's deck is extra wide for simpler transfers and more user participation in the sit-to-stand process, which is so vital in achieving standing mobility. Wheel lock - Mobile stander's large wheels each come with a lock that the user can operate to keep his or her stander firmly in place. Once ready to move, the wheel locks can be easily released. 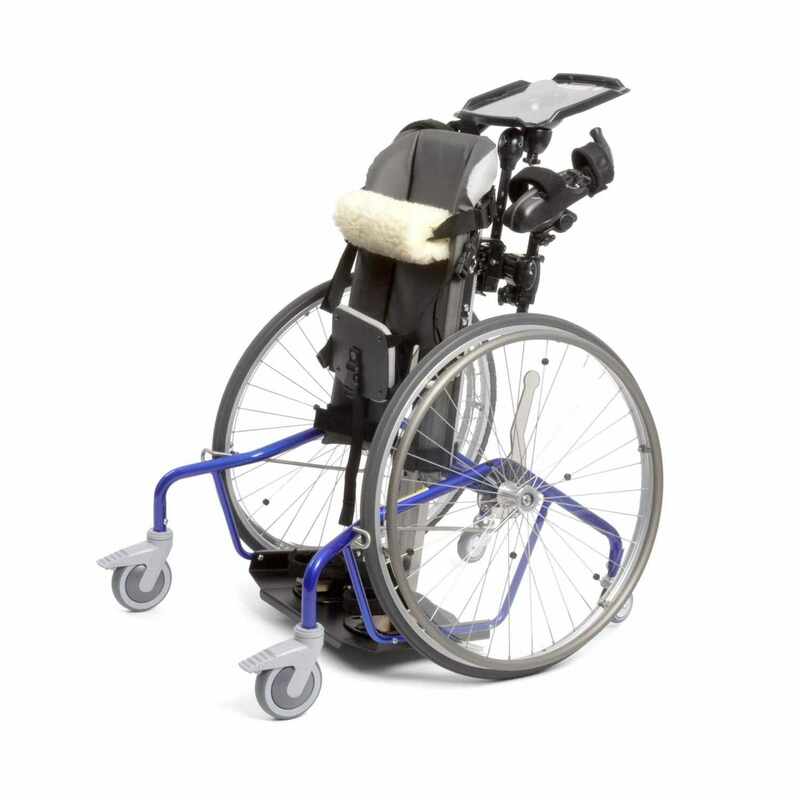 Adjustable body support - The body support adjusts according to the user's size and requirements. A child who is 25" tall fits into the mini mobile stander, while the large mobile stander can accommodate a young adult up to 65" tall. Seat pad - Our unique, adjustable seat pad allows gradual increases in weight-bearing and develops standing mobility skills. 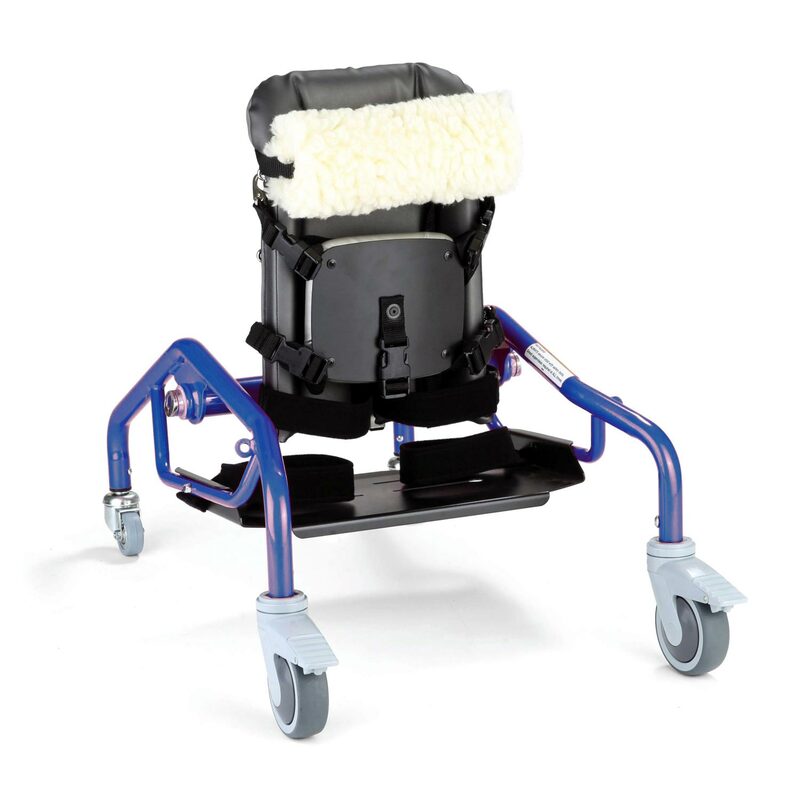 Mobile stander supports zero weight-bearing clients, enabling even double amputees to be upright and mobile. 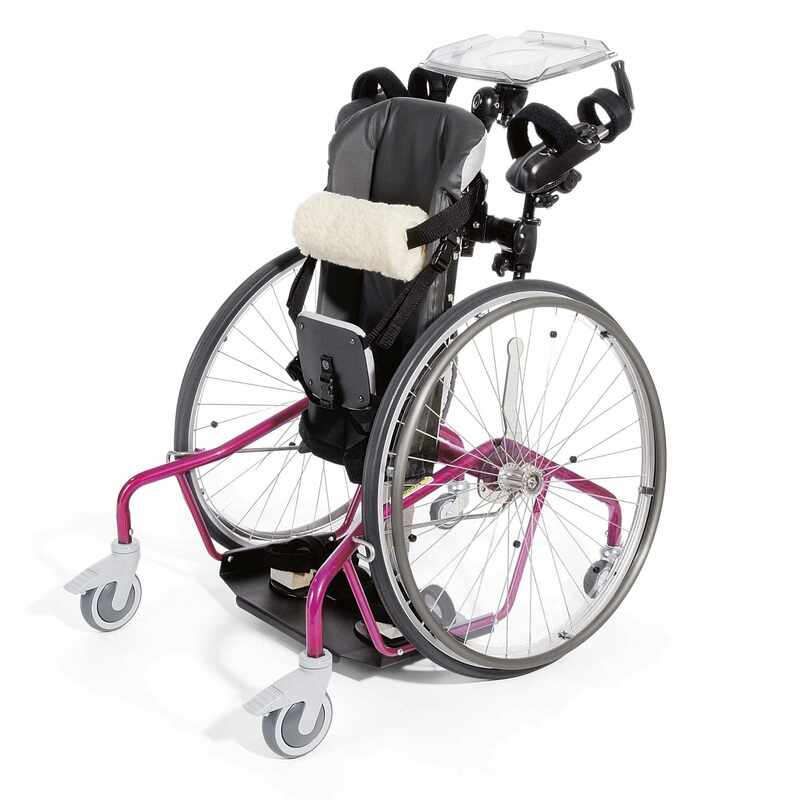 Removable wheels - Optional large wheels pop on and off with the push of a button. Wheel locks provide security, spoke guards protect fingers, and hand rims keep hands clean. This photo shows the mobile stander in use without the large wheels. -- Please Select --Frame, 21"